I've Been Charged With Shoplifting, What Can I Do? Home > Virginia Criminal Defense > I’ve Been Charged With Shoplifting, What Can I Do? I’ve Been Charged With Shoplifting, What Can I Do? So you’ve been charged with shoplifting, what can you do? The first step is not to panic. You need to remember that a charge doesn’t necessarily mean a conviction. You still have the opportunity to get the charges dropped, or at the very least, reduce the penalties as much as possible. Tackling this situation head-on is the best way to reduce the fallout and allow you to begin moving on from these charges. This can be an extremely confusing and stressful time, so you should consider hiring a criminal defense attorney who fully understands shoplifting laws to guide you through the process. Shoplifting is one of the most common types of theft in the Commonwealth of Virginia. This can include small instances like sticking a piece of candy in your pocket to trying to slip a new iPad in your purse. Either way, it’s considered larceny. If you are faced with these charges you need to do everything possible to try an avoid a shoplifting conviction, as these can have serious negative effects on your life. Getting a job, renting an apartment, or passing a background check are just some examples of things that can become increasingly difficult if you have a larceny charge. Getting ahead of your possible conviction is the best way to avoid these consequences, and to do this you really need a good criminal defense attorney. 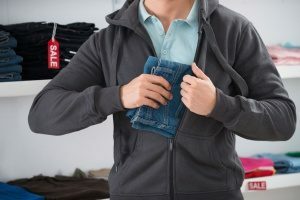 Many people have the misinformed idea that shoplifting is restricted to the action of sticking something in your pocket or purse and walking out the door. This is not true as they are other ways to shoplift. For example, altering or switching the price tag on an item is retail theft. You can even be charged with retail theft by simply concealing an item within the confines of the store, even if you have not attempted to leave. Whether it’s accidental or not, you can still be charged with shoplifting. However, your intent with the concealed item can be brought up during court as part of your defense and may have an impact on your case. Navigating the circumstances of your charge in the right way is essential in attempting to get your charges dropped or penalties lessened. To do this, you need an expert criminal defense attorney who knows the shoplifting laws and can present your case in the right way. It’s very important to understand whether you are being charged with a misdemeanor or a felony, as both have very different penalties associated with them. A misdemeanor is an offense that is considered less serious than a felony, but more serious than an infraction. In Virginia, misdemeanors are divided into four classes which determines the possible punishments that can be issued if found guilty. In the case of shoplifting, if the value of the goods or merchandise is less than $200, then it is considered petit larceny which is a Class 1 misdemeanor. Class 1 misdemeanors are punishable by up to a year in jail and/or a maximum fine of $2,500. A felony is usually classified as the most serious types of offense. One of the defining characteristics of a felony is that the punishment often times includes at least one year in prison. The sentence will have to be served in a prison facility rather than a local or county jail. In regard to shoplifting laws, it’s considered grand larceny if the value of the goods or merchandise exceeds $200. Grand larceny is a felony and is, therefore, punishable for 1 to 20 years in prison. The judge or jury also has the option to sentence you to less than a year in jail and/or a maximum fine of $2,500. If you’re faced with these charges, your next step should be to hire a criminal defense attorney who can take a look at your case and determine what the best course of action is. They will be familiar with the shoplifting laws which will help them present your case in the best way possible, while also providing you with realistic expectations for the outcome. Whether you’re faced with a misdemeanor or felony charge, both should be taken extremely seriously. The proceeding steps are relatively similar as it is highly advised in both cases that you seek out a criminal defense attorney. Don’t just accept these charges, there is hope for a better outcome. In the case of shoplifting, the merchant is considered the victim, and they have a lot of say in whether charges are amended or dismissed. If the merchant seeks restitution, and you are guilty of shoplifting, you should pay them as this will make them much less likely to demand a criminal conviction or a jail sentence. If you are innocent and intend to take the matter to trial, you should not pay restitution. Paying restitution can make you look better in the eyes of the merchant and the judge or jury, which could potentially have a positive effect on your case. Paying restitution is also a good idea because if you are found guilty, paying restitution can be part of your penalties. One of the simplest parts of dealing with a charge is showing up to court, although many people overlook its importance. If you’re facing criminal charges your presence in court is mandatory, and your absence can lead to a warrant for your arrest. If your charge is a municipal ordinance violation your presence is not required, and your absence can mean the judge will find you guilty by default. If you’re faced with a shoplifting charge, misdemeanor or felony, the best thing you can do is take responsibility for your actions. Don’t sweep this under the rug and hope it goes away, do everything in your power to help lessen the effects of your mistake. Hire a criminal defense attorney who specializes in shoplifting laws as they are your best tool in righting this wrong.